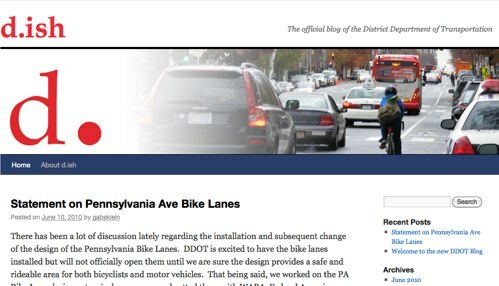 We have been working hard to create a more transparent DDOT and a customer-centric agency and this new blog is the latest of many outreach components we are excited to launch. We have beefed up our communications, marketing, transportation demand management (TDM), and IT capabilities (we have a great new CIO, Lance Schine btw). And, btw again, Lance Schine, who joined DDOT on May 10, will be a panelist at an upcoming event on June 15 about “online engagement for sustainable urban mobility,” hosted by EMBARQ, the producer of this blog. He’ll be talking about things like interactive information displays for bus shelters – another example of how innovative and well-planned communications can help improve transportation in the District. D.ish, you’re on our blogroll!